Many of the classes available on CoM are spell casters. The spell casting procedure may seem difficult at first but is easy to grasp with some practice. First, look at your available skills using the MAGIC command. 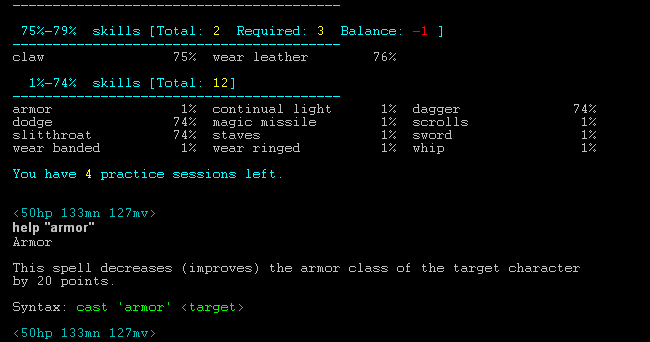 You can then type PRACTICE to see the percentages of those spells. This character currently has all of his magic spells at 1%. This guide will focus on how to cast the ARMOR spell. 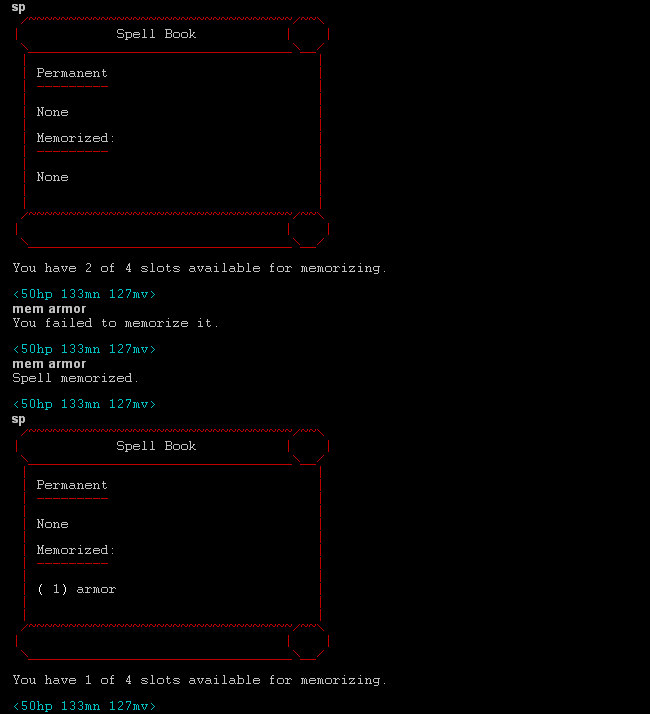 It is beneficial to first look up the spell in the help files to see what it does. To use a spell, you must first PRACTICE it. For easier leveling and the purposes of this demonstration, we’ll practice armor to 74%. Next, you must MEMORIZE the spell into your spellbook. You can type SPELLBOOK to see what spells you currently have and how many spellslots you have remaining. 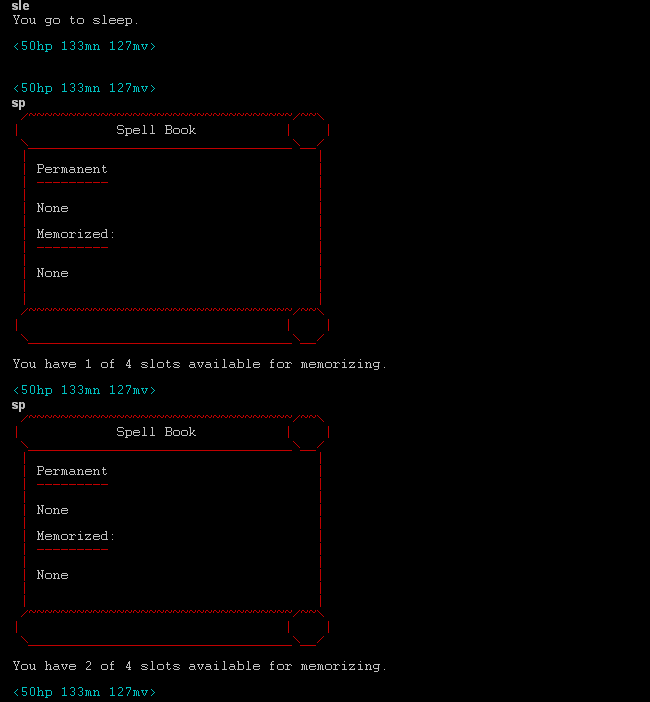 Notice how the spell appears in the spellbook and your free spellslots decreases by 1. Finally, you can cast the spell using CAST ARMOR. From the helpfile, we see that the spell can take a target, meaning you can cast it on other players or mobs. We’ll just cast it on ourselves. The spell’s affect will show up in AFFECT. The spell disappears from the spellbook after it is cast, but your free spellslots also decreased. How do you regain those spellslots? Just sleep and you will regain a certain amount after each tick. Now the process repeats again. As you level up, you will gain the SOLACE and TRANCE skills, greatly increasing the number of spellslots you recover every tick. This is why it is best to focus on melee skills until you are higher level. You can use spells to level just as with any other skill. Most spells increase through use. Remember how ARMOR can be cast on other targets? You can cast the spell on other mobs to try and improve it. Notice that it is possible to target the second dagahasi and taurlok trainees in the room using the 2.target syntax. It is also possible to memorize more than one spell at once, as shown above. That’s all there is to spell casting! All spells are cast the same way, but may have many different effects. Be sure to read the help file for each one before attempting it! 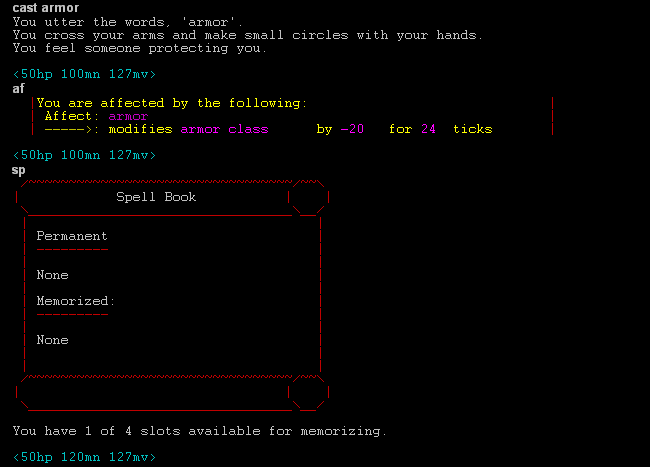 There are also special spells that must be cast with the INFEST, COMMUNE, and PROJECT commands instead of CAST. These all work the same as CAST, with the exception that COMMUNES require that your character worship a deity. Other help files that may be of use to you are HELP CASTING, HELP MEMORIZE, HELP FORGET, HELP SPELLBOOK, HELP TRANCE, and HELP SOLACE. If you are still confused, please ask an immortal for help.